All the natural resources are depleting which has made it mandatory that we choose materials and construction systems that require less energy for its execution. 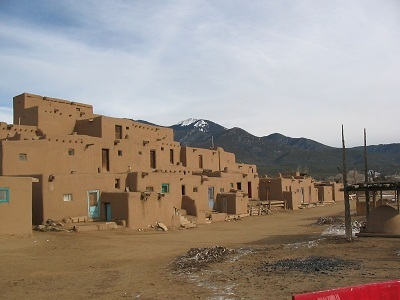 Mud Architecture is one such construction system that involves use of mud as a building material and has various techniques for the construction. This construction system is less energy intensive and very effective in different climatic conditions. The first and the simplest and almost certainly the oldest system of mud construction is called “cob”. Cob has been used since the prehistoric times. It makes use of sand, clay and straw. Large lump of stiff mud, is roughly moulded into the shape of huge elongated eggs. (30-40cm long and about 15cm in diameter). A row of these cobs of mud are laid neatly side by side – preferably somewhat pressed together. Then another row of cob is laid on top, in the depression between the holes and the cracks disappear. With care and experience, also the use of sharp knife like instrument, smooth flat surfaces can be acquired. 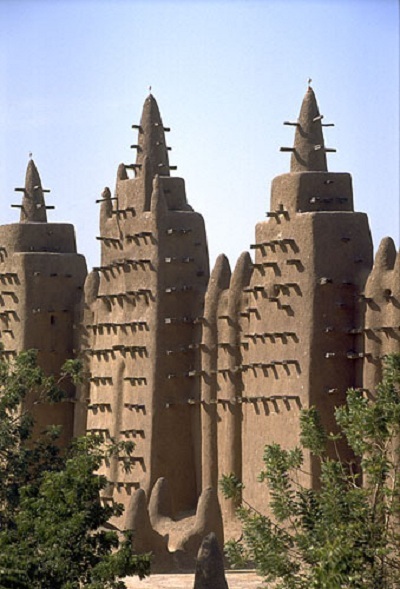 This is probably the most popular form of mud walling because the mud blocks or bricks can be made by anyone, and after drying they can be stored until there are enough of them and the right time to build has come. A small box or mould of wood or metal is used and stiff clay is squashed into the mould and then turned out to cure and slowly dry, which can be used in the same way as burnt brick or cement blocks. 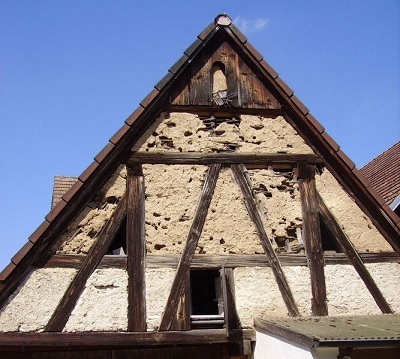 Wattle and daub is a building material used for making walls, in which a woven lattice of wooden strips called wattle is daubed with a sticky material usually made of some combination of wet soil, clay, sand, animal dung and straw. Mud is used as a plaster to cover thin panels of cane, split bamboo or other stalks that are woven together and held in place by wooden or bamboo posts and beams. Usually the frame structure supports the roofs. This system is similar to the adobe blocks but the bricks are machine made in a simple machine which costs around 100usd to 150usd. The blocks are strong and those using a small amount of stabilizer are usually as strong as the local country made bricks. The same precaution of slow drying and protection from moisture applies to compressed blocks also. Developed in cob wall in order to standardize or regularize the thickness of the wall, this method is used. It is also an attempt to increase the strength of the wall by ramming it. Basically, two parallel planks are held firmly apart. Stiff mud is thrown in between these two planks and rammed either with a wooden or metal ram rod. When one section is complete and hard, the two boards are moved along and the process is repeated until the whole plan is complete. The first three methods of construction i.e. 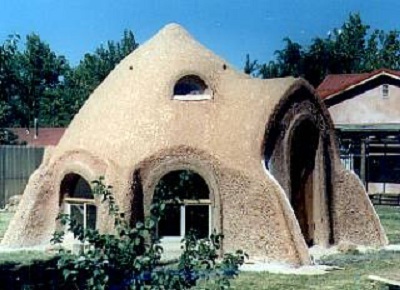 cob, adobe and wattle and Daub are traditional methods of construction. 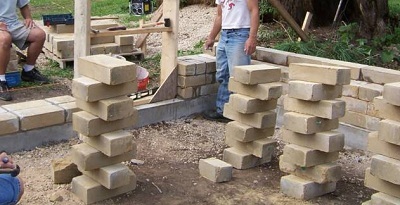 Rammed earth technique was used earlier and is also used in present day construction like the pressed earth blocks. 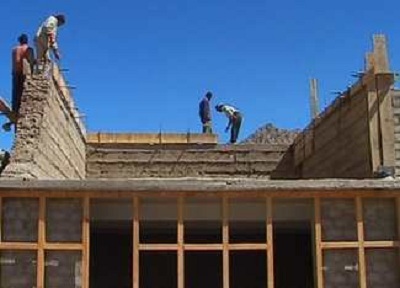 But among the above two modern day construction rammed earth is a better option as it has less overhead, in situ practice and almost same quality or finish can be obtained compared to the machine. This entry was posted by Benzu JK on June 14, 2010, 7:40 am and is filed under Architecture. You can follow any responses to this entry through RSS 2.0.